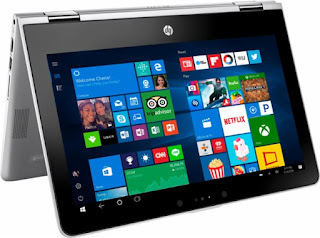 The HP PAVILION X360 11M-AD013DX is a laptop PC equipped with the processing power of Intel Pentium N4200 quad-core SoC from Apollo Lake Architecture primarily for inexpensive notebooks that features 2 MB level 2 cache and runs at the base clock speed of 1.1 GHz with Burst speed of up to 2.5 GHz. This also offers an integrated GPU called Intel HD Graphics 505 based on Intel's Gen9 architecture with 18 EUs and a clock of up to 750 MHz, and supports DirectX 12. This HP PAVILION X360 11M-AD013DX laptop PC is packed with different features such as 4 GB DDR4 SDRAM system memory for basic multitasking; 500 GB 5400 RPM hard drive for serviceable file storage space; 360° flip-and-fold design that offers versatile functionality with laptop, audience, tabletop, presentation and tablet modes; B&O PLAY, dual speakers; full-size island-style keyboard; HP Imagepad with multi-touch gesture support; multi-format SD media card reader; HP Wide Vision HD Camera with integrated dual array digital microphone and a 2-cell, 37.01 Wh Li-ion prismatic battery with up to 8 hours of battery juice. It comes in HP finish in natural silver for stylish look. This HP PAVILION X360 11M-AD013DX comes packed with 11.6" multitouch screen for hands-on control with a screen resolution of 1366 x 768. 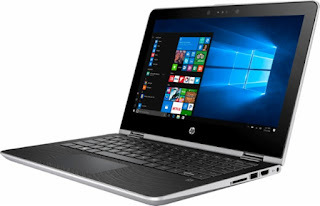 This resolution is typical to entry level laptops so it is expected that it is not that sharp and clear compared to laptops with higher resolution. With regards to connectivity, this laptop PC comes packed with Bluetooth interface syncs with compatible devices; 3 USB Type-C ports; Next-generation wireless connectivity to connect to your network or hotspots on all current Wi-Fi standards; and HDMI output expands your viewing options. This laptop PC is powered by Windows 10 operating system that brings back the Start Menu from Windows 7 and introduces new features, like the Edge Web browser that lets you markup Web pages on your screen. This laptop measures 0.8 inch x 11.6 inches x 7.9 inches and weighs about 3.06 pounds. You can get this laptop at the price of $399.99. Do you have this laptop PC? Share with us your experiences with this particular device. Other laptops in this price range include Dell Chromebook CRM31892NN30; LENOVO 320-15ABR 80XS0024US and DELL INSPIRON I3567-3636BLK-PUS.